Yes, we're still here. After an extended summer hiatus the Ráday Salon blog is back! With many apologies for our extended period of silence, occasioned largely by serious technical difficulties on our end (read: near-catastrophic and still not perfectly resolved computer crash). We've had several inquiries from friends new and old, wondering when they'd be seeing a new Salon event. Well, rest assured, we are working hard on pulling together the first event of Fall 2006. We are most grateful for your patience and hope to be able to announce a date very, very soon. Many thanks to all of you who attended the June 1st showing of Aishah Shahidah Simmons’ documentary film NO!. 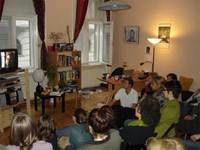 The event attracted a wide group of people – not just old friends but also some new faces – and the film itself generated an extremely active and spirited discussion, which lasted well after the end of the film. You can get a sense of just how much people were involved in the discussion from the photos, available here or by clicking the link in the Salon Photos menu to the left. Also newly available in the Salon Photos section are a (very) few photos from our first Salon of the new cycle, when we showed the film Murder on a Sunday Morning. With a thousand apologies for the delay, we are happy to be able to say that the photos from our most recent Salon event -- 6 months ago, before our lives got a little crazy -- have finally been put online in a photo gallery for your viewing pleasure. The event featured Dr. Clarence Lusane, visiting from American University in Washington, D.C., who gave a presentation based on his book, Hitler's Black Victims. In the last few weeks, we have been pleased to be able to share Aishah Shahidah Simmons' documentary "NO!" with at least 40-50 friends in two separate showings -- we added a second showing in response to the many requests we received by people who were unable to attend the first. (Click here to read our original invitation to this event.) Both showings stimulated intense and provocative discussion on the ever-present problem of abuse against women. Though the documentary is centered on the African-American experience, participants, both men and women, from a wide variety of backgrounds responded to the essence of the film's message, reflecting on similar problems within their own cultural milieu. We have posted photos of both the first showing and the second showing, which you can view by clicking on the links. We also encourage you to visit the film website at http://www.notherapedocumentary.org/ and to sign the NO! guestbook. If you were unable to see the film this time, please let us know as we are happy to schedule repeat showings. Many thanks to those of you who were able to join us on April 7th for our first women’s issues discussion. We had a full discussion, with some new faces and many different voices participating. Click to view just a few photos of this evening. The photo gallery for the February 24th Salon evening is now online. Enjoy! Thank you all again for another wonderful Salon evening, and for the lively and open discussion. We hope to have more photos posted soon, and will continue to be posting new links as well. We will be taking a small hiatus from "Eyes on the Prize" now, and will return to the remaining three episodes at a later date. Our next Salon will have a focus on women's issues, in recognition of International Women's Day (and Women's History Month, in the US). We are also always planning ahead for future Salons, and are looking forward to expanding the range of topics. If anyone has something in mind, let us know - we are happy and eager to build Salon evenings around your ideas, too. Hurrah for our first Salon evening! This past Thursday, Ráday Salon saw its inaugural event. About 25-30 people gathered to watch the first two episodes of Eyes on the Prize (see original invitation). The evening began with a little socializing around the food and wine in the kitchen, before we all gathered in the front room to start the show. Michael set things up with some welcoming remarks, and also gave a bit of background to the films we were about to watch. After the films, a group discussion followed. All told, our first Salon evening was a rousing success! We did come up with a few ideas for fine tuning things next time (for example, elevating the TV so people can see better). Also, after some discussion on the point, we've decided to cut back to showing only one video at a time in future. People were all right with watching 2 hours worth of film, but because Friday is a workday and folks can't stay out quite as late, watching only one video would leave more time for discussion and conversation. Thanks to all for coming, and we hope everyone enjoyed the evening as much as we did. Hope you enjoy these photos of the night, too. We look forward to seeing you again in two weeks, on Thursday, February 24th, for one more installment of Eyes on the Prize.